This has long been a sorry excuse for a “plaza,” and the Google Street View above does a fair job of capturing its desolate landscape. It’s unattractive dead space that further deadens the area around it, particularly on its prominent Milwaukee Avenue side. 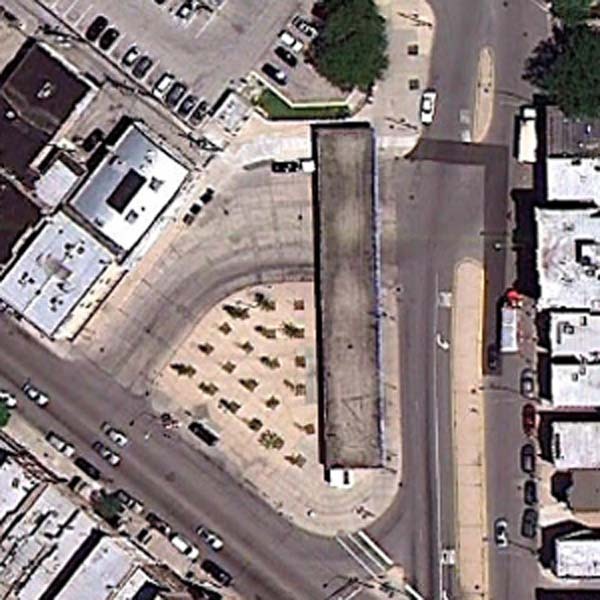 As alluded to in one of the comments on Pedestrians have been left out of the multi-modal Logan Square transportation hub, revamping the plaza area will assist with bringing pedestrians to a more prominent and rightful place at this transportation hub. Depending on how the proposed food truck ordinance plays out, I would like to see a variety of mobile food dispensers (ones that do not cook on-site that would not directly compete with the bordering restaurants) alternately but regularly set up shop on part of what is now an unnecessarily wide bus turnaround space. As I wrote in a comment on the proposed (Woodard) plaza, food is one leg of the triumvirate of things that attract people to place, along with play and water. There’s currently a need for more bike parking. The hierarchy of preferred bike parking seems to be inside the station, covered bike racks outside the station, uncovered bike racks, followed by anything a cyclist can lock a bike to. There’s no more room inside the station (except at the unattended end), but there is room for more covered bike parking. Why not make that bike parking as play? 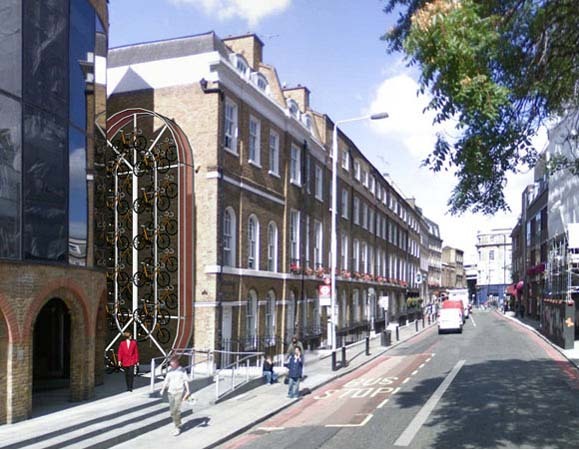 Like MANIFESTO Architecture’s Bike Hanger design (see rendering right, click to enlarge). The design still under development provides for a type of Ferris wheel for bikes, and the wheel is powered by pedal power from a stationary bike at the bottom (look carefully behind the red jacket in the rendering). A kid can come to the plaza with purpose to lock up his bike on the wheel and catch the train to other destinations, but spend a bit of time before or after engaging with this attraction and others at a newly configured plaza. With some modification for better weather protection, I could see a few of these on the Milwaukee Avenue side of the plaza helping to form a much needed street wall on the east side of Milwaukee Avenue. I lack confidence that the CTA will allow any type of water feature even though it’s a compelling draw for most people. I’ll leave open a small window of hope since the North/Clybourn Station on the Red Line has one. 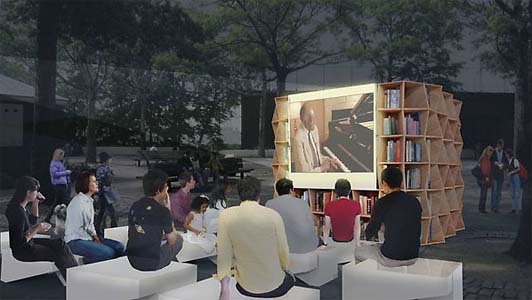 I’d like to keep a central area open for performances and temporary installations like The Uni, “a tool to share books, showcase the act of learning, and improve public space” (see rendering left, click to enlarge, and click on link above for more configurations). It’s a project that would perhaps serve those using the space in a traditional manner, providing some reading material for those waiting on a bus. It’s also a project that would bring people to the place for multiple purposes, reading by day, screening by night, for example. It’s a fabulous idea (that you can be a part of through the Kickstarter campaign, BTW)! I maintain that effective public places either need a consistently engaging draw or need to be programmed with changing activities to draw people in. It’s not different from semi-public places like shops and restaurants. If they don’t have new merchandise or a variety of dishes on the menu, you’re unlikely to return. You could also revisit some Blair Kamin words I chose in writing Here’s why the orchard proposal doesn’t work, and some alternatives. Then, please share what you’re thinking about, and don’t hold back. Let your imagination loose! If you can, include links to images to help us understand what you’d like to see. We need lots of ideas to get this ball rolling. This entry was posted on Thursday, July 21st, 2011 at 8:41 am and is filed under Logan Square, Milwaukee Ave., place. You can follow any responses to this entry through the RSS 2.0 feed. You can leave a response, or trackback from your own site. While there’s no more space inside the Logan Square L station for bike parking, there’s an opportunity to use the space more efficiently. 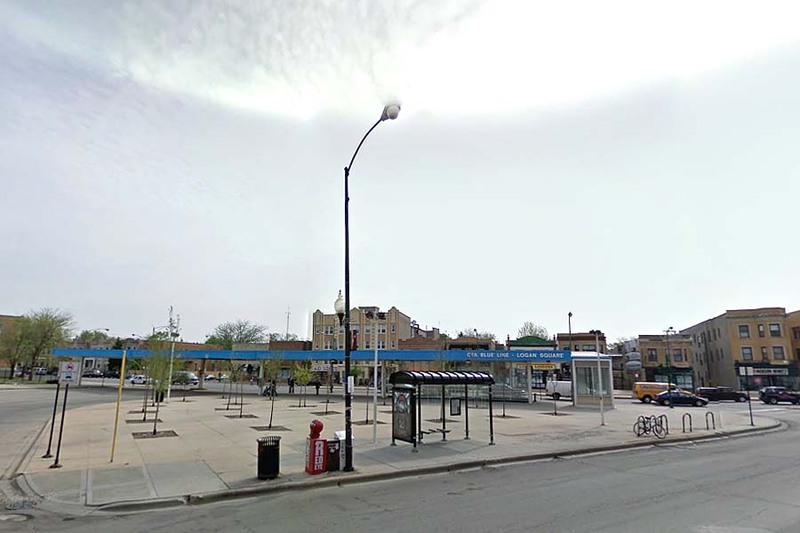 The CTA could move a high-capacity bike rack from Midway – where the exterior ones see little use – to this station. Steven: How many do these hold vs. U racks 2 per? Is it the length of them that would increase the capacity? Am I the only one who wishes they had a little coffee and pastry cart or kiosk on the plaza? I saw these at every Caltrain suburban station I visited in the Bay Area. Sometimes you just want something right away, without having to hike to a coffee shop. And please–an enclosed but visible waiting area for the winter. The heating coils positioned 15 feet above are a waste of energy. You could add covered bike racks to the space, as well. If there was a coffee place on the plaza, it would help discourage thieves. Everytime I walk by the plaza I envision it as a green space in my head! I love that there are other Logan Square-ers who share my same feelings! Great ideas here. I spent a little time over the weekend asking people passing through the space and waiting for the bus what they’d like to see: green, shade (note it was a hot, sunny day), winter shelter/wind break, kiosk/coffee cart, lowered warming lights, extension of the glass (to the north), divided seating, grass, color, community message board (above and below ground), people handing out reading material (e.g. RedEye), amphitheater/place for people to speak, food trucks, cameras for bike security, pergola with removable roof (like stadium roof), cultural programming, better signage (below ground). I agree with all the comments. Also, how about some seats in the plaza? How much of a dent would that be for CDOT’s budget? Thanks Lynn for starting this!! There is much going on above- and below-ground at the CTA station. New lighting, painting (going on all night towards the back entrance – witnessed last night upon returning from O’Hare), escalator repairs or replacement, fixtures installed – if I am correct, there is new installed panels inside elevators which wasn’t there before?. They added some plants to the dirt which houses the trees (though one sad little tree doesn’t look like it has made it, no leaves on the tree). I believe those trees were replaced last summer. I know this is not the case, but I can’t help but laugh… it’s as if the Queen (Anna Wintour) has spoken and we must put our best face forward! The absolutely need more bike parking, shade / benches would be great to foster more community development, love the idea of food trucks and some sort of coffee / pastry cart (there is the small convenience mart inside, but that is mostly snacks, drinks, lotto, CTA passes, not artisnal/independent products). 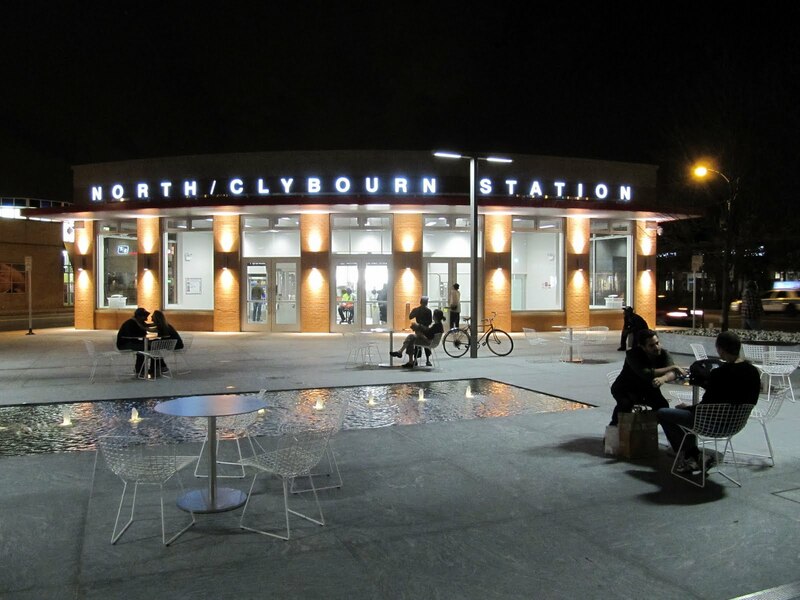 I think the clean up at the station is part of a program to do all maintenance and repairs at a single station in one, discrete period, to “revolutionize” its appearance in one go. It will improve the customer experience a bit. Probably nothing happens soon. Chicago is broke. CTA is even in worst condition. Who is going to pay for this. I think the Blue Line station painting it’s everything we can get in today economy. Sad but true.